Roccalbegna dominates the valley of the river Albegna at the slopes of mount Labbro, south of the Mount Amiata. It's about 19 kilometers far from Podere Santa Pia. The village lies on the southern side of the mount Labbro at the confluence between the rivers Armancione and Albegna, for a long time strategic zone for the control on the road that crosses the whole area of the Mount Amiata. 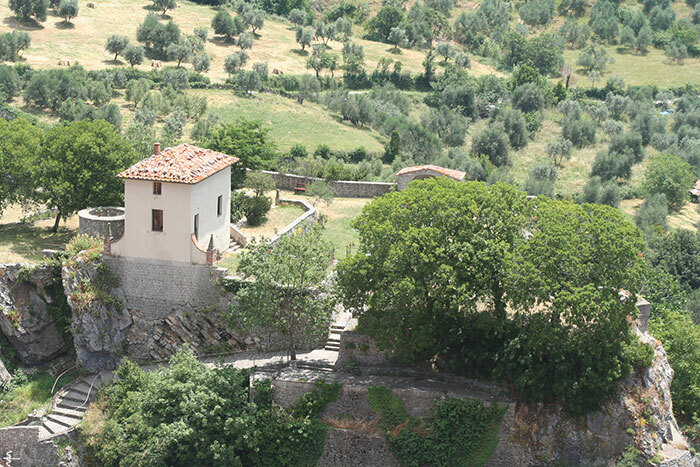 Roccalbegna is a singularly positioned village situated above the confluence of Marlancione torrent and Albegna. It leans on two cliffs, il Sasso (stone) or Rocca (rock) to the north and the Cassero of Siena to the south. Sasso is a cliff of app. 60 metres height and almost vertical. You can enjoy an incredible panorama from the top of the cliff, with the houses appearing at the foot of the rock. You can climb up the rock using a path and some stairs. There is a split of the rock in the middle of the way up. It is an entrance (a bit uncomfortable) for a cave from which you can go out to the right, returning back to the halfway of the staircase that leads up to the peak of the Sasso. On the top, there are remains of a small fortress that dominates the village and offers a great panorama; at the roofs of the houses, in front is the Cassero and at the horizon the entire countryside of Maremma. Down to the vilage we found the other cliff, which is dominated by Cassero of Siena. Its construction dates back to the half of the XV century. From here on you may enjoy a great view at the Sasso and the village. There are only two quadrilateral towers and a part of the wall that have remained from the Aldobrandescan fortification strengthened by Siena. The valley of the Albegna river is characterized by some of the most beautiful European canyons. The origin of Roccalbegna is certainly Etruscan. In the Albegna valley, numerous Etruscan graves have been excavated. Furthermore, plenty of local places' names are of Etruscan origin like Albegna, Cana, Valerona. The Chiesa Maggiore dei Santi Pietro e Paolo dating back to the XIII century, is in Romanic style and conserves an altar piece considered to be one of the most significant masterpieces of Ambrogio Lorenzetti. The construction of this religious building dates back to the thirteenth century. Inside some works on canvas by del Tommè and de Salimbeni. The Portal of the Chiesa Maggiore is its most interesting element, the architrave considerably lowered towards the right reveals the yielding the building suffered on that side just a few centuries after its erection. One item of notable importance is a standard from 1799 of the “Viva Maria” bands which opposed the French occupation after the Revolution. In the interior of the Cassero of Siena there is Oratorio del Santissimo Crocifisso (Oratory of the Saint Crucified), presently assigned to a small museum that testifies the value of the artistic property preserved in Roccalbegna. There is a number of sacred paintings preserved here, however the most important one is without doubts the Cross painted by Luca di Tommè which became inserted in the tabernacle of the altar. Roccalbegna is known for its Marzolino di pecora, cheese made from sheep’s milk. 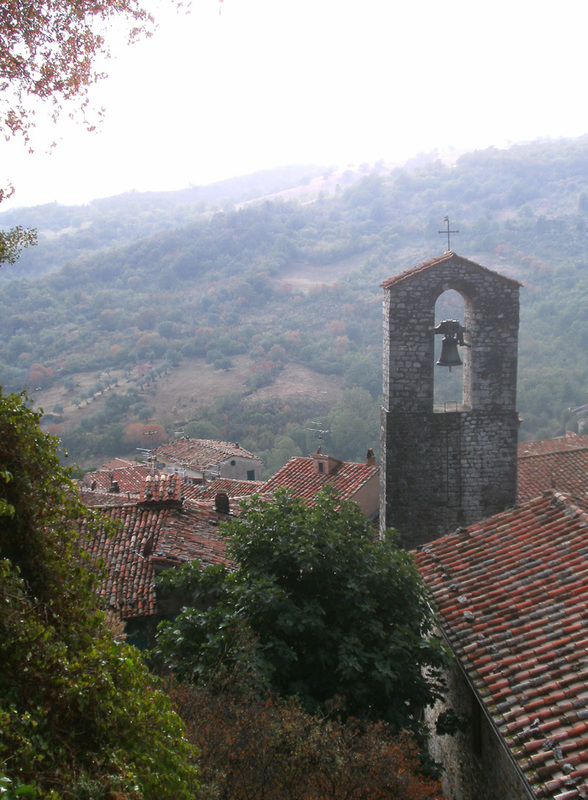 The ethnographic collection is housed in the former blacksmith's forge in the village of Santa Caterina. The two floors of the small museum contain the collection documenting working life and religious rites in the area of Mount Amiata. 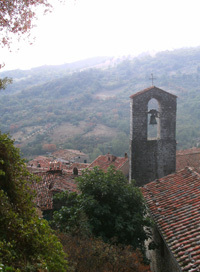 The Santa Caterina Ethnographic collection is housed in the town’s old Fabbro Ferraio forge. The museum documents the local work, traditions, and rituals surrounding fire (‘focarazza’) festival and the woodland of Mount Amiata. The exhibition is split into two sections: the first section is home to a collection of work and household tools used in the lifecycle of fire. The second section focuses on the ‘stollo’, or wooden pole, which symbolises the Focarazza Festival. This ancient festival is part of a tradition dedicated to Saint Catherine of Alessandria and is held every 24th November. It is the most important date on the local calendar. The various atmospheric stages of the festival are illustrated in a detailed photographic exhibition, alongside local works of art and books. The museum is also home to an interesting collection of children’s toys. Going down towards Saturnia, shortly outside of Semproniano up on a rock along the Albegna river, rises the medieval village of Rocchette di Fazio, dominated by the ruins of the Rocca Aldobrandesca. The castle of the Rocchette di Fazio rises in the valley of the river Albegna. In the Middle Age the whole valley, above all the hills that were the watershed with the adjacent valley of the River Fiora, was subjected to the counts of the Aldobrandeschi family and, from the 12th century, all the castles of the area passed under their control and most of those were rebuilt or strengthened. Just below Rocca Aldobrandesca is the 13th century Santa Caterina Parish Church, today deconsecrated, and inside the walls are still well preserved the Palazzo di Giustizia and the Palazzo Pretorio. Main sights are the Rocca Aldobrandesca from the 12th century, l'Ospedaletto di S. Tommé (1330), the Tribunale, the Palazzo Pubblico and the Pieve di Santa Cristina in Romanesque style. In the Albegna valley, numerous Etruscan graves have been excavated. Furthermore, plenty of local places' names are of Etruscan origin like Albegna, Cana, Valerona. 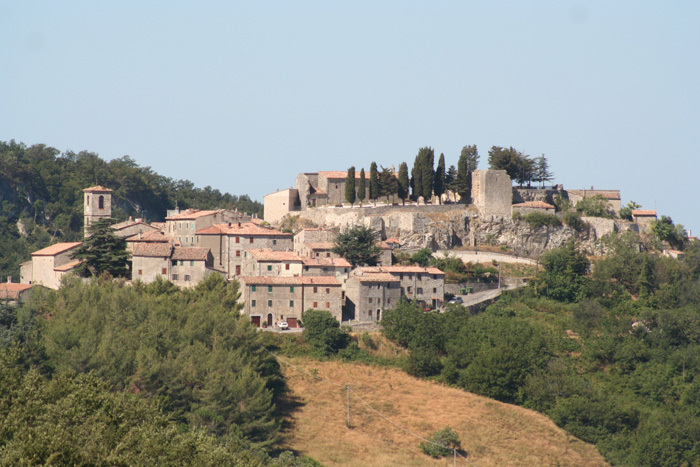 Semproniano is situated just 9 km from Terme di Saturnia, in a hilly territory, between splendid scenes and landscapes of the Maremma Tuscany. With its cultivated countryside, waterways and valleys of the rivers Albegna and Fiora, the village deserves to be visited. Main sights are the medieval Palazzo Civico and Palazzo dei Vicari Mediceo, the church of Santa Croce, faced by the remains of the Aldobrandeschi castle (Rocca), the 12th century (renamed in the 16th century) Pieve dei Santi Vincenzo e Anastasio, the castle of Catabbio, built in the 12th century by the Aldobrandeschi and later used by the Orsini of Pitigliano, and the notable medieval burgh of Rocchette di Fazio. The centre of Semproniano still maintains this charming medieval feel with its quaint alleyways and picturesque stone houses. Within the ancient and beautiful walls lie the ruins of the Aldobrandeschi fortress, in which only the foundations remain today. The church of Santa Croce, found in the centre, was built in the 12th century and is a symbol of the town's romantic atmosphere. It has a Roman Gothic style, with a bell tower dedicated to Saint Vincent and Anastasio and a painting of the Rosario on the inside walls. 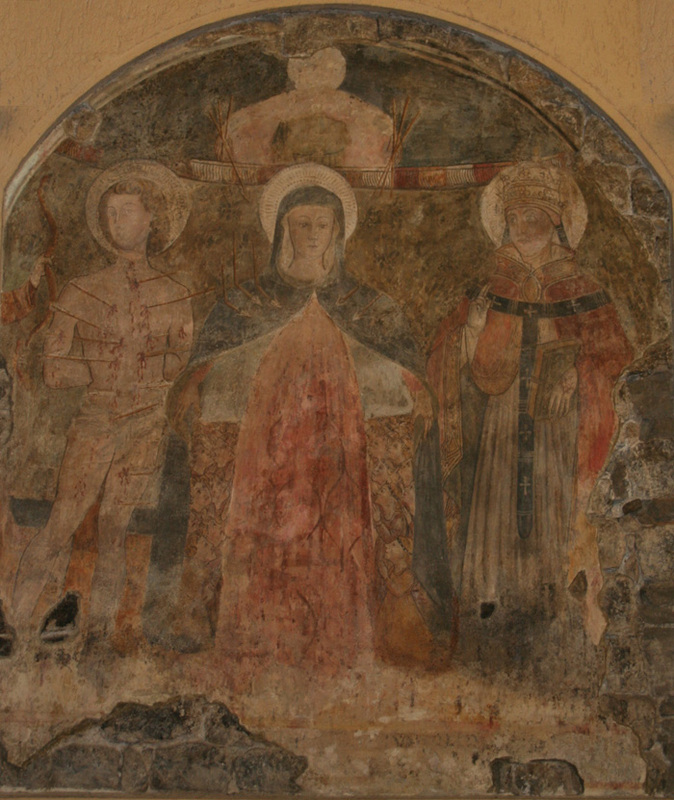 La Pieve dei Santi Vincenzo ed Anastasio (The Parish Church of Saint Vincenzo and Anastasio) is a religious building dating back to the 13th century and home to some splendid frescoes of the 1500's. From Semproniano the road goes almost consistently uphill to the fork between Petricci and Cellena, both routes go to Triana. When you reach Triana the first sight that impresses is Triana castle (Castello di Triana) which dates back to 776 in documents of the San Salvatore Abbey. The Castello di Triana, 6 kms from the town of Roccalbegna, sits on a rocky promontory and is enclosed by medieval stone walls, whcih are still in remarkably good condition. Outside the walls is the Chiesa San Bernardino alla Triana. The Focarazza di Santa Caterina is an ancient fire ritual, it's a symbolic celebration held on the eve of the birthday of St Caterina di Alessandrai, in the nearby frazione Santa Caterina. famous Pecorino, which you can taste while you’re there. The area around Roccalbegna offers some lovely walks among the various nature reserves. Near Roccalbegna, the 1800-acre Riserva Naturale Monte Labbro spreads over the southwesterly slopes of Monte Amiata, offering a spectacular view of the of the typical Tuscan landscape. The Reserve is situated on the north slope of Monte Labro (1.190 m) and represents the northerly limit of the Albegna high valley. Monte Labro is calcareous, has a highly impressive landscape and is of considerable naturalistic interest. This vast area was center of a 19 th century religious movement that sprung up around the controversial figure of David Lazzaretti, a local prophet. The Parco Faunistico dell'Amiata, Mount Amiata Faunal Park is part of Mount Labbro Nature Reserve. It spreads over some 200 hectares and is dedicated to the study, protection and safeguard of a number of animal species semi-wildly living within large areas. In the Nature Reserve, one can follow long guided trails. The Reserve's woods are easily explored on foot, on horseback, or on a mountain bike, by following the network of paths based on the ancient ramblings of mushroom hunters and woodsmen. Directions: take the N 323 from Arcidosso Arcidosso. Follow the directions to Roccalbegna (N 323) and after about 8 km turn right taking the road to Mount Labbro. Follow the directions to the Monte Labbro and Parco Faunistico dell’Amiata. In the area around Roccalbegna, two smaller Nature Reserves, Riserva naturale Pescinello (149 ha) and in river Albegna higher valley the Riserva Naturale di Rocconi. Pescinello Nature Reserve is based on the upper reaches of the Albegna river, within the municipality of Roccalbegna. It was established in 1998 and includes a total area of 149 hectares. The reserve hosts centuries-old trees of impressive size and beauty, such as hop-hornbeams, cornel trees, downy oaks and lime trees. The guardians of this reserve are attempting to re-introduce the capovaccaio, a bird of prey. The Reserve can be reached from Roccalbegna by taking the Triana Road and, after about 2 km, turn left onto an unsurfaced road with indications for the Reserve. Riserva Naturale di Rocconi, or Canyon Nature Reserve is a WWF Oasis located on the harsh gulleys of the Albegna, including the municipalities of Semproniano and Roccalbegna. Riserva di Rocconi was established in 1996 and spreads over 900 hectares circa. The Reserve also includes Rocconi Oasis founded by the World Wildlife Fund in 1995 on 130 hectares of land to protect the environment of this area and its amazing variety of flora and fauna through the development of a number of itineraries. The variety of wild orchids (25 species surveyed), is of extraordinary interest. The pathway originates in the old town of Roccalbegna and crosses, climbing up and down, a wide stretch of the old Maremma, passing near the localities of Poggio Lago, Podere Rocconi (Reserve of the Rocconi's forest), Podere Ceccherino, La Crocina, and returning then, once passed the Albegna, towards Rocchette di Fazio and Semproniano (this last village can be reached from Rocchette even by the asphalt road). The stretch between Rocchette and Semproniano is also shared by the pathway number 8. This itinerary is a mixture of white pathways and asphalt roads and presents just one demanding stretch, corresponding to the crossing of the Rivo Torrent; the pathway winds up for about 13 km and it can be covered on foot in about 4 hours. We strongly recommend this itinerary as a unique opportunity to admire the wonderful valley of the Albegna river, which is characterized by some of the most beautiful European canyons, as well as to visit the fascinating old town of Rocchette, rare example of a perfectly maintained medieval village situated on overhanging rocks. Three walks take you to Roccalbegna and the hamlets of Triana and Rochette di Fazio, each with their individual features. The Reserve can be reached from Roccalbegna by taking the Triana Road and, after about 2 km, turn left onto an unsurfaced road with indications for the Reserve. Marked red and white. From Roccalbegna to Rocchette di Fazio, 3 uur, marked red and white. Trough il Fosso delle Zolferate, Podere Molinaccio, Podere Casagrande, Podere Pezzano and il Fosso Calizzano. From Semproniano to Rocchette di Fazio 1,5 hour, marked red and white. From Rocchette di Fazio to the course of the crystal clear Albegna River. 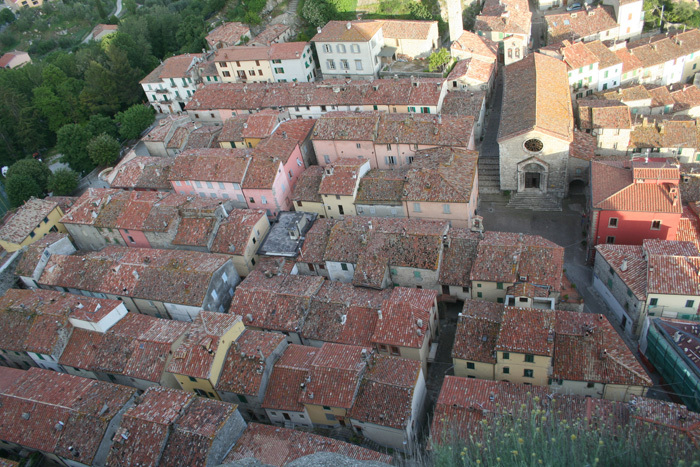 Follow the itinerary to Roccalbegna. Maps | Kompass gide + map nr.653. Roccalbegna borders the following municipalities: Arcidosso, Campagnatico, Manciano, Santa Fiora, Scansano, Semproniano. The municipality of Roccalbegna contains the frazioni (subdivisions, mainly villages and hamlets) Triana, Cana and Santa Caterina. The municipality of Semproniano contains the frazioni Cellena, Catabbio, Petricci, and Rocchette di Fazio.